Is there a way to automate legal agreements to be sent additional times if not filled out? Also, where do I see responses to the additional fields I've made mandatory in my agreement? 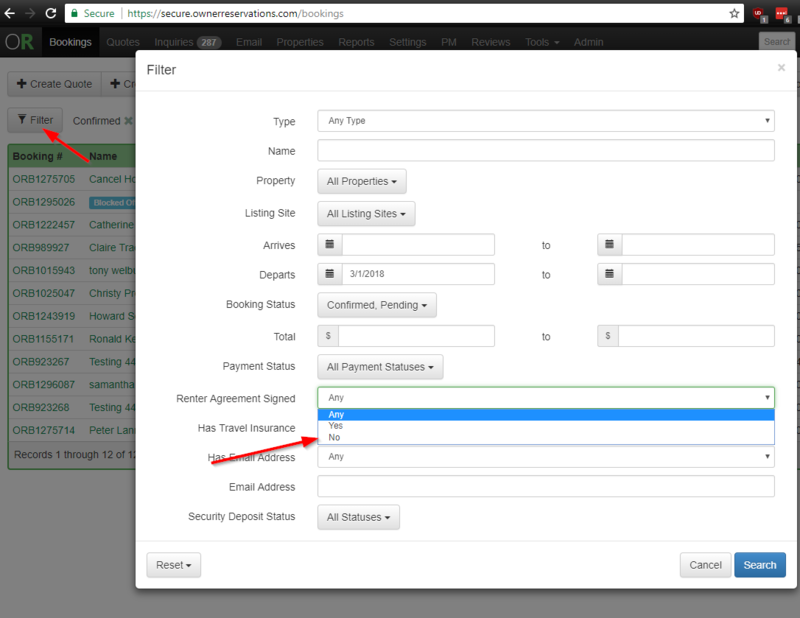 We don't currently have a way to automatically follow up on legal agreements, but you can filter the list to show bookings with no legal agreement signed (see screenshot). You can see the responses to the fields on the Custom Fields tab of the booking. Has an auto reminder been done yet for legal agreements? I have a bike and lead paint agreement. Can these be auto sent as soon as I get the signed lease? Is there a way to grab links to all of my agreements at once and send that - manually or automatically? Could you combine them all to one agreement? That'd be a lot simpler for guests, who seem to have issues getting just one thing signed, never mind 3.